Contains merging options like merge all pages, specific pages, pages from defined range, etc. Thanks Kernel for PDF Split & Merge. I combine or split my PDF files to suite my requirement. It is really nice that PDF documents are more manageable now! 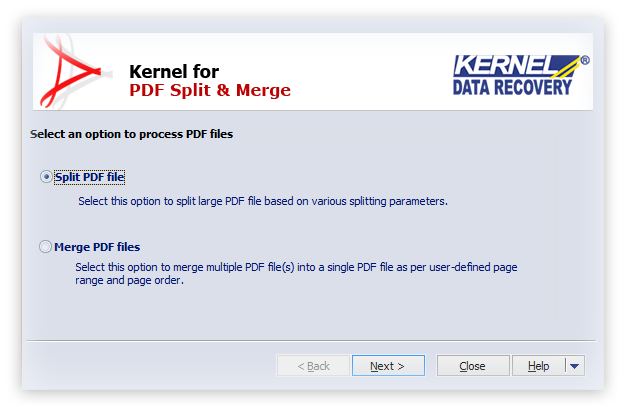 Kernel for PDF Split & Merge completes the splitting and merging operations very quickly within a few mouse–clicks. Users can get the resulting documents in a few minutes. Resulting documents will strictly be according to the options selected by the user. It allows users to split PDF files by criteria like Page, Page Range, Size, and Even/Odd pages. While merging, it allows users to add files individually or to add a folder of PDF files. Users can opt to merge only the specified pages. Also, users can prioritize the page order. After splitting, the tool names the output files in sequential order for easy identification. Also, the resulting documents–in splitting and merging–can be saved in the desired location. Kernel for PDF Split & Merge is a user-friendly tool. 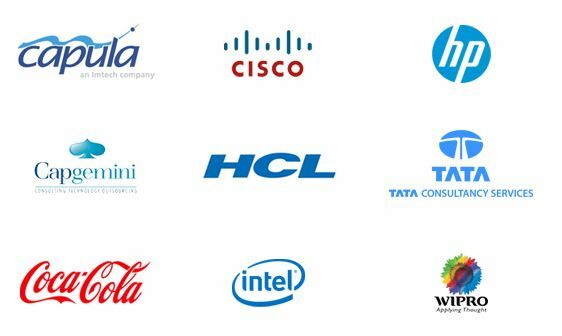 It provides necessary instruction on every screen the help users perform the process without any confusion or doubt. You do not require Adobe Acrobat or Reader to use Kernel for PDF Split & Merge. You can install and use it without having any other PDF tool. The tool offers simplified ‘Range’ feature to let the users easily define merge parameters. Such as ‘blank’ indicates merge all pages, whereas comma (2, 6) indicates specific pages to merge, hyphen (3-8) indicates extraction of pages from specified limits and so on. 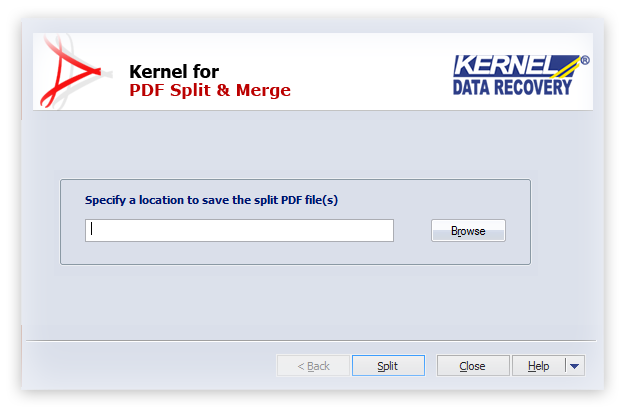 Kernel or PDF Split & Merge completes in operation in some simple steps. This tool performs quick and efficient split and merge function and makes the PDF files manageable and transferrable by splitting & merging pdf files. The important steps one would require to follow for splitting operation are given here. I have some large PDF documents. A few pages of these documents need to be circulated among many people. Can I separate these pages from the main document so that circulation through email is easy? Yes. For this you need a perfect PDF splitting tool like Kernel for PDF Split & Merge. Using this tool, you can create a new PDF document with the required pages. What are the advantages of splitting and merging PDF files? Merging and splitting enables users to manage PDF files more effectively. Sometimes, it is difficult to upload or share very large PDF files. In that case, you can choose to upload or share only the revenant pages of the document. While storing PDF files, it may be confusing if you have many PDF documents having related data. Merging them together makes it easier to handle them. Also, sometimes it is easier to share or upload a single merged document than sharing or uploading many similar documents. What happens to the content on the pages after splitting or merging PDF files? Does it remain the same? Splitting or merging using Kernel for PDF Split & Merge will not affect the content on the pages of the PDF document. Also, the structure and properties of the document remains the same. So there is no need to worry about the integrity of the data on PDF pages. Only thing is that you need to choose the splitting and merging options carefully. I have downloaded Kernel for PDF Split & Merge. But the pages of PDF files created using this tool show a red diagonal stamp 'Kernel for PDF Split and Merge Demo' on them. Is it possible to remove them? You are using the free trial version of Kernel for PDF Split & Merge. That is why there is a diagonal stamp. You can get rid of this by purchasing the full version of the tool. The full version does not show this stamp. After purchasing Kernel for PDF Split & Merge, how can I learn to use it? There is nothing to learn in using Kernel for PDF Split & Merge. You can use tool just by following its on-screen descriptions. Also, there is a help file integrated to this software. Ifyou have any queries or doubts left, you can contact our technical support team by mail, chat, or phone. Kernel for PDF Split and Merge tool launched by Nucleus Data Recovery. This tool helps the user to split large PDF files and merge multiple PDF files into one PDF file.